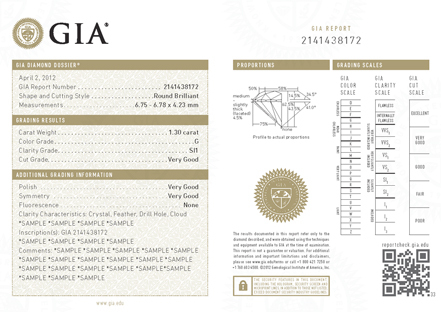 The Gemological Insititute of America, GIA, has been entrusted with grading some of the worlds most famous diamonds, and brings the same unmatched expertise to grading yours. Independant and non-profit, GIA is considered the final word on a diamonds authenticity and quality. GIA developed the 4C's and the International Diamond Grading System™, the standard used around the globe. GIA screens every gemstone to identify simulents, synthetics and known treatments. Expert gemologists examine each diamond under controlled lighting and viewing conditions, in order to provide the most rigorous assessments of a diamonds 4C's. 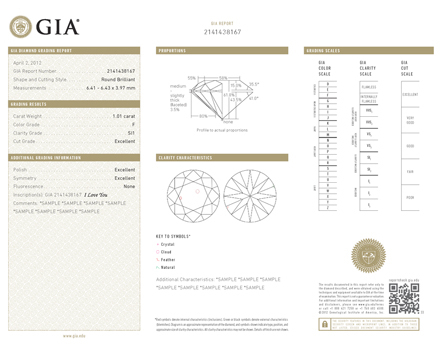 Every GIA Grading Report contains these assessments along with additional descriptive information and state of the art security features for a diamond. Buying a diamond is a momentous decision. GIA Reports let you make it with confidence.